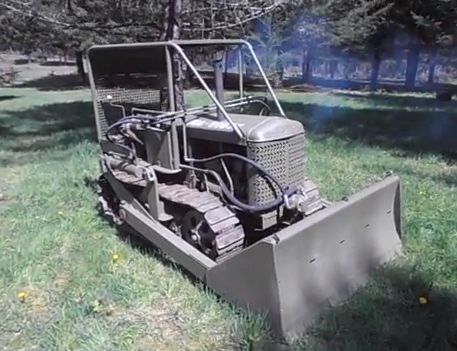 This is a completely original and fully functional 1937 Oliver Cletrac Bulldozer. It has a diesel 4 cylinder engine that is water cooled. This is a very rare option. It also has the rare factory hydraulics for the push blade, as well as the factory gear driven winch on the rear. The driver’s canopy is a factory original option as well. The machine functions very well, and is a strong runner. I used it a bit around the farm to test it out, and the brand new steering clutches are a real treat. It idles strong and tight, and runs up through the ranges without any problems. It has three forward gears, and one reverse gear. There is a winch on the rear as well, and it is driven by it’s own actual differential, with one axle stubbed off and sealed, and the other has a drive gear attached to chain drive that actually drives the winch. Super beefy. Cable and hook are there too. It has been sanded and cleaned, then repainted in a fresh three coats of WWII Olive Drab Green. It is the same type as the M2 that were used in the South Pacific during WWII, but this one remained stateside, serving with the Washington State Fire Department, cutting firelines. Tracks are a bit tired, but will function forever as a display and demonstration machine, and the fuel tank has no corrosion or leaks. Ready to show, and everything works.